Did you know that the average, privately owned drilling machine is only used 13 minutes during its entire lifetime? The rest of the time, it just lies idle. This begs the question why we buy something that we hardly ever use. Would it not be much easier to borrow it from your neighbours? The idea is simple and has significant benefits. When you borrow things instead of buying them, you save money, which potentially frees up time that you would otherwise spend working. Furthermore, it saves natural resources since goods are used much more efficiently. In addition, you get to know your neighbours better (and help them by lending your own things to them). Nowadays, the internet allows for smart, new initiatives that connect people to exchange goods. Sharing – in contrast to owning – helps to get a “better” economy, rather than a bigger economy. This is convincingly explained in the famous “Story of Stuff – Solutions” video. That sounds all very sensible, but how does in work in practice? The thought of sharing your precious belongings with strangers may seem scary at first. You worked hard to purchase your possessions, handle them with care, even covet them. You may not use most of them often, but when you do, you are happy that you once bought that shovel, saw or power drill. Will a stranger use my tools with the same care as I do? Will they return them to me in the same condition? And will I have to chase them? In other words, do I trust my neighbors? Once I got over these doubts, I decided to give it a try and went on the Peerby website. I had heard about it on television, but did not know anyone who used it. After a free and simple registration, I soon received a Peerby request from a young woman who had moved to my neighbourhood and needed a saw for cutting the planks of her new wooden floor. I had once purchased a saw for my new balcony floor and I had not used it since. The excitement of being able to help someone and waking up my saw from its state of eternal hibernation was stronger than my reluctance to hand my tool to a stranger, so I replied that I had a saw and explained where she could pick it up. When the doorbell rang an hour later, I may have been more excited to lend my saw to my new neighbour than she was to borrow it. A few days later, after some exchanges via text message to set a date for returning the saw, the young woman returned it to me, in excellent condition. She was so grateful that she also handed me a box of chocolates. I was touched and any remaining doubts to lend my things to strangers were erased. A few days later I was in need of a baby bed for my nephew. My brother and sister-in-law were visiting with Bastiaan, their 1-year-old son. I didn’t have a spare bed for him, so I went on Peerby to ask my neighbours for help. Look at all the Peerby users in my neighbourhood! I described what I needed and why I needed it. The website then sent my request to Peerby users in my neighbourhood, based on the postal code I provided during the registration process. I could see on the website that there were many registered users in my direct neighbourhood. Based on this, my hopes were high. What happened next, exceeded my expectations. “Seven neighbours have already offered a baby bed for Bastiaan in just one hour!” I told Ivar, thrilled about the positive responses. Some neighbours had simply answered “yes”, others had added a personal note, such as where I could pick it up and what exactly they had for me. It made me feel wonderful to have such generous people in my neighbourhood. People I had never met, but lived so close to me and were willing to lend me a baby bed for free, no strings attached. I picked the closest neighbour – Peerby provides the distance of each respondent – and picked up the baby bed a few hours later. In nine years of living in Amsterdam-West, I had never really interacted with my neighbours, except the ones in the same building as me and the lady next door who takes care of the plants in front of the building. Because of my Peerby request, the neighbourhood suddenly became a bit less anonymous. I was looking at the profile pictures and personal messages from Anne, Tom, Peter and Saskia who had offered a baby bed: the first manifestation of living in a real community. Since becoming a Peerby member I have been getting daily requests from my neighbours for anything from tools (hammer, power drill, saw) to electronics (printer, digital camera, play station) to party essentials (standing table, board games, cooling box) to transportation aides (bike, car, van). As Peerby member you can set the number of requests you would like to receive per day or even opt out of receiving them. I realised that I had many things to offer to my neighbours, due to my habit of buying something whenever I needed it. That is how I ended up with various tools that are seldom used (and only clog up a closet). Peerby opened up a new world to me: the sharing economy. Rather than owning everything yourself, it is sufficient that someone in your neighbourhood owns it and is willing to share it. The focus is on the use of the product, not its ownership. Since its launch in September 2012, Peerby has grown steadily. It expects to have 500,000 users by the end of 2015. It is present in the Netherlands, Belgium, London, Paris, Berlin, as well as ten pilot cities in the United States. We are confident it will soon be all over the world! Peerby’s social mission also follows from its business model. It does not charge anything for its services, there are no advertisements on its site, users do not get unsolicited e-mails. In fact, Peerby does not earn anything from making peer-to-peer sharing possible. To keep on growing and earn some money, Peerby recently launched PeerbyGo, which enables users to rent what neighbours offer online. Peerby takes a small margin from the rental fee. By minimising the number of items someone actually has to own, Peerby stimulates a shift in priorities: material possessions become less important, helping others and getting to know your neighbours become more important. This is indeed what sets Peerby apart from sharing platforms that work with a central place where goods can be exchanged or products used or rented. Examples of these are public libraries, laundromats and companies that provide the goods for sharing to participating users, such as Greenwheels and Car2Go (cars for sharing parked in neighbourhoods). Peerby works on a peer-to-peer basis. By using technology that enables it to send requests to users within a small distance of where the applicant lives Peerby stimulates sharing among inhabitants of the same neighbourhood. This social factor makes Peerby such an innovative and positive tool for making our economy more sustainable. In addition to Peerby, many more enterprises have been established recently which lower the barriers for people like you and me to participate in the sharing economy. They enlarge the market space for the sharing economy and often have solutions to problems that may arise when a borrowed tool, bike or car breaks. Peerby, for example, offers the borrower the option to purchase insurance for the borrowed article. While Peerby is free to use, SnappCar – an online platform to share cars – uses fees to pay for the use of a car, its insurance and administration. SnappCar thus enables car owners to earn some money in exchange for offering their cars to neighbours. 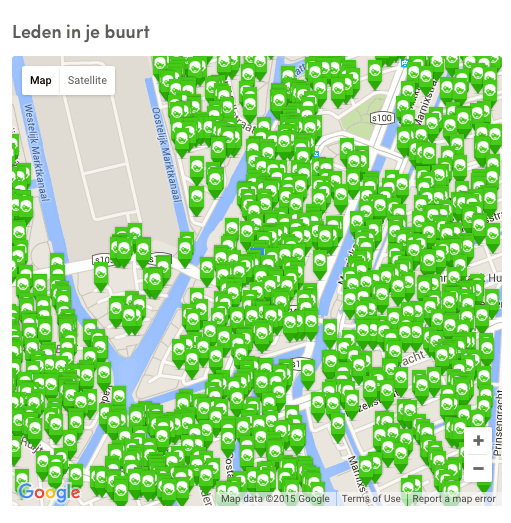 Another example of a paying system for sharing is Lena, a “fashion library” in Amsterdam. Similar to a library for books, Lena levies membership fees. It has a physical store to display women’s clothes that can be borrowed. The clothes are mostly second-hand and sourced from sustainable producers. The store also has washing machines (including one with dry cleaning technology) to ensure that you get a clean shirt, dress or jacket. And if you want to keep the item you borrowed, you can purchase it. 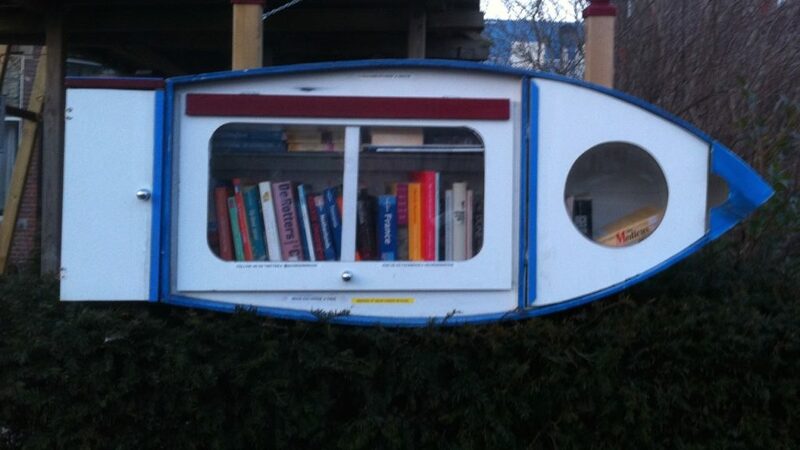 “offline” book sharing in our neighbourhood – in the shape of a boat! their journey around the planet. Spullendelen – share anything in your house and garden with other members and post what you would like to borrow; free membership without commitments. Ruilen.nl – One-to-one exchanging goods. Post what you offer and what you look for in exchange. Littlegreendress – Exchange your clothes for second-hand clothes of others. Bring your clothes to an event and select “new” clothes. Small participation fee for an event. Facebook group: Amsterdam deelt/geeft – lets members post goods they would like to give away to the first person to respond. Gratisoptehalen.nl / gratisaftehalen.nl / gratisafhalenonline.nl: lets anyone post something to give away. For some you need to make an account first. You might wonder, not all goods can be shared that easily. How about things you use every day such as your bike, computer, smartphone, jeans or home? For those goods it may not be very practical or desirable to lend them to someone. From an environmental perspective, it is often best to buy such products second-hand, lease them from the manufacturer, or buy a good-quality item for maximal durability. Another category of things that might be difficult to share are things you no longer need, but are still valuable. Examples could be antiques, your car, second home, boat or motorbike. For those goods, it makes most sense to let them out or sell them. With more than 7 billion people living of the finite resources of one single planet we have to find a way to use our goods smartly, minimise and recycle waste and curb consumerism. The “sharing” economy is a great step towards achieving less consumption and waste, less resource use, more conscious living and an increased sense of community. It challenges the fundamentals of our traditional, linear economic growth paradigm very effectively: “sharing” is the new “owning”. And when “sharing” might not be ideal, renting out, selling or leasing might be good alternatives. While this article focuses on initiatives we have found in Amsterdam, similar initiatives could easily be applied in many other places, provided sufficient people participate. We therefore encourage you to research existing initiatives in your area or set them up. Setting up a facebook group to give away things only takes a few clicks. We would be happy to get you in contact with the initiators of some of the Dutch projects.